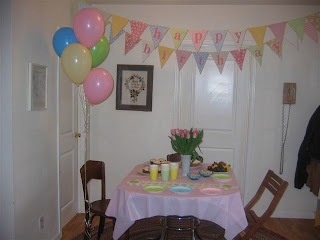 We did in fact end up having a party in honor of little Miss Annabelle Lucy's first birthday this past Saturday, after having cancled and rescheduled, TWICE. My parents were there all the way from ID. which was a treat, to say the least. 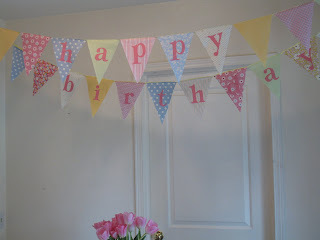 Mom and I whipped out this pretty party banner last minute. We were both so thrilled with the way it turned out and I would love to make more to sell in a my very own online shop at a place called Etsy. It is still hanging over the table in my dining room and find myself still so enchanted by it that I may end up leaving it there forever. 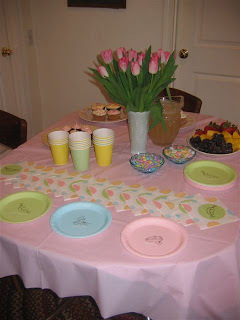 As you can see, our little party was a complete with pink tulips, cupcakes, a soft yellow with polka-dots, " floo-fee" dress and a bunch, a bouquet of sorts ,if you will, of beautiful " guests" all laughing and eating jelly beans. 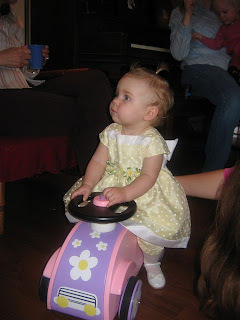 And I must make mention of all the lovely little presents, like the oh so cute, wee girly pink car shown below, a so sweet gift from Annabelle's lovely Great Auntie Kris. It was a smashing success if I do say so myself. my daughter and I had a few friends over to decorate cupcakes. and their mother came over to celebrate this love-filled day with us. and sugar cookies. The morning of we made the frosting, in two different colors. 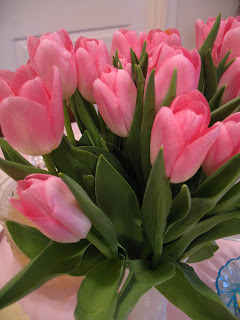 and setting the table with them. Our friends arrived and we quickly set about to decorating. and then ran off to play upstairs! All in relative peace and quiet, I might add.